The International Support Network for African Development (ISNAD-Africa) is a pan-African initiative raising global and multi-stakeholder support for clean energy transition and climate resilience Africa through a multidisciplinary network of various stakeholders active in sustainable energy, environment, and climate change fields across the globe. In 2017, ISNAD-Africa launched the Mentoring for Research Programme (MRP) to establish technical and thematic mentoring relationships between students in African Universities, and, experienced researchers and professionals across the globe. Students selected for the programme are those who are undergoing master’s and doctoral degree programmes in any discipline and are conducting the research for their thesis on sustainable energy, environment and climate change topics in their respective disciplines. The programme currently has, as mentors, researchers and professionals from various institutions and organisations such as the World Bank, Intergovernmental Panel on Climate Change (IPCC), Harvard University, University College London among other world-class institutions and international organisations. The 2018 cohort of the programme currently has 40 mentors who are supporting 37 graduate (24 PhD and 13 Master’s) students (mentees) in 26 universities across 13 African countries selected from 278 applicants in 108 universities across 22 African countries, through a collaborative and multi-stage process. By working with our partners in 2018, ISNAD-Africa also secured fellowships and grant which funded some of the outstanding students (Mentees) on the programme to participate in international trainings and conference in Germany and Spain. 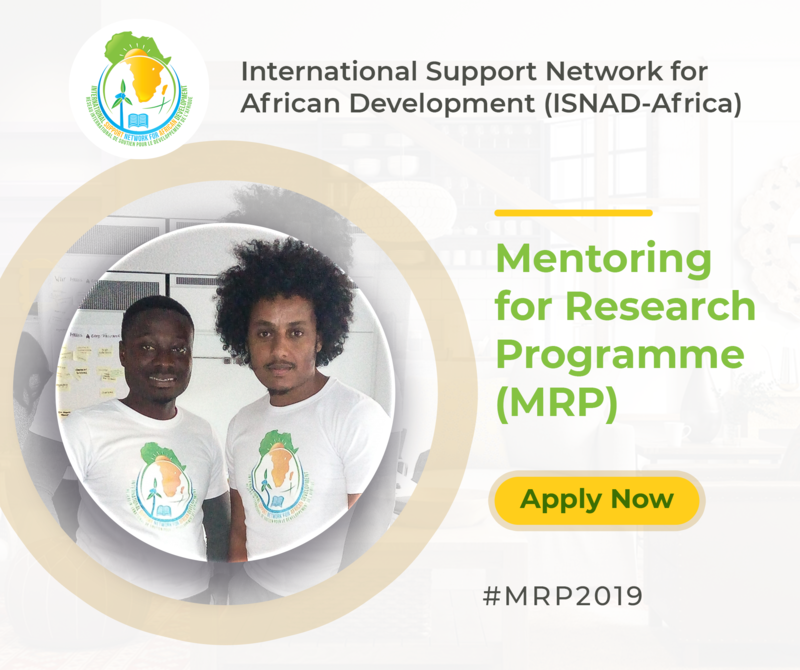 In commencement of the 2019 cohort of the programme, ISNAD-Africa is inviting applications from qualified and interested students (Master’s and Doctoral) in universities across African countries for the 2019 cohort of its Mentoring for Research Programme (MRP). Participation in a six (6)-session webinar training, on sustainable energy, environment and climate change (including soft skills), to be hosted by the Copenhagen Centre on Energy Efficiency (C2E2), a joint initiative of the Danish Government, the United Nations Environment Programme (UNEP) and the Technical University of Denmark (DTU). admission into a one-year one-to-one mentoring relationship on your research with an experienced researcher or professional (with expertise in your area of research) from world-class organisations such as the World Bank, Harvard University, Intergovernmental Panel on Climate Change (IPCC), Chatham House, and International Renewable Energy Agency (IRENA) among other international institutions and organisations. Applicants should be carrying out their research in 2019. (Please note that the research may be a new or ongoing research, however, priority will be given to research projects that are at their early stages). Also note that students whose research programme extend beyond 2019 are also eligible to apply and could be considered for extension till the completion of their research. Applications are welcome from students in any discipline (Technology, Sciences, Arts, Law, Social Sciences, Environmental Design and Management, Agriculture, Health Sciences, ICT, among others) provided their research are on sustainable energy, environment or climate change-based topics. In addition to the conventional research topics (such as energy access, renewable energy policy), innovative and non-conventional research topics such as climate photography, environmental journalism, among others, will be of special interest. All applicants are required to complete an online application form with short summary of their research concepts. Shortlisted applicants will be invited to participate in the webinar training sessions and submit a one-page research proposal using a standard format that will be provided to them. Based on the quality of research proposal and participation at the webinars, successful applicants will be admitted into the one-year mentorship programme. As an impact and knowledge transfer mechanism to promote youth action on environmental sustainability in Africa, applicants selected for the programme will be required to participate in an idea competition for a self-proposed Environmental Education Outreach in their communities. Best ideas will be selected and funded for implementation by ISNAD-Africa and guided in the implementation process. The impact story will be allocated a dedicated page on ISNAD-Africa website and promoted on its social media platform. Qualified and interested applicants are invited to complete the online application here.